Sunday Matters: provides information on all aspects of liturgy and worship such as upcoming training for liturgical ministers and altar servers, how to get involved in music ministry, times of children’s liturgies, and dates of monthly Eucharistic Adoration following the 6:30 p.m. Mass. 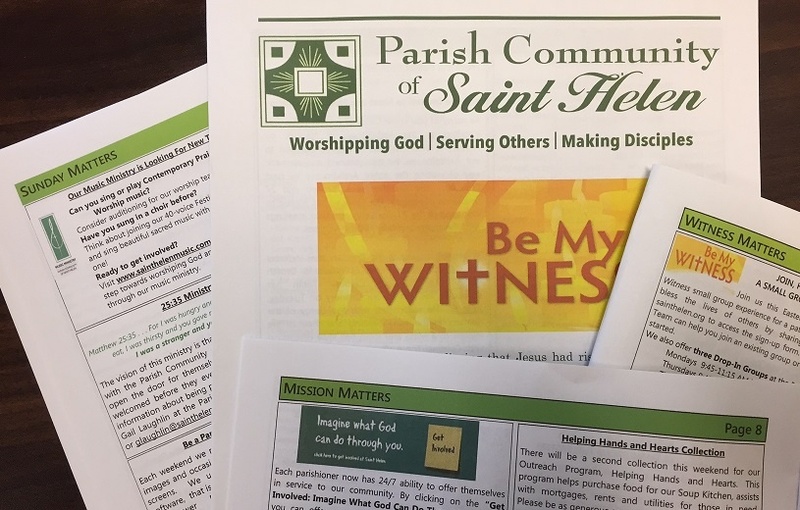 Welcome Matters: highlights how to register in the parish, get involved in a ministry for welcoming new members, and use the updated website to find information. Belonging Matters: captures all the ongoing activities and upcoming events that make parishioners of all ages recognize their gifts and feel engaged in parish life. A recent bulletin included topics on sign-up information for RCIA and other sacramental preparation, toddler music classes, young-adult ministry gatherings, spiritual direction, and more. Witness Matters: presents the ways that the parish encourages members to share their faith journey with others. The centerpiece is the small-group faith sharing for Be My Witness that gathers participants to reflect and share on their transformation into missionary disciples. Other initiatives include a training session on how to speak with someone about the Catholic faith. Mission Matters: last, but certainly not least, offers the many opportunities to “go from the sacristy into the street” by serving others in the parish and broader community. This section highlights the many outreach efforts including weekly deliveries to food pantries, youth visits to the local homeless shelter, and transportation for the elderly. For another way to make the parish bulletin a tools of evangelization, read, "Many Voices, One Sunday Bulletin." Be My Witness is a parish evangelization process offered by RENEW International that equips leaders to lead change and engage parishioners as missionary disciples.